Thrill cheesecake and apple cake lovers alike with this glorious fall dessert. No springform pan required; it's made in a pie plate! Mix butter and graham crumbs; press onto bottom and up side of 9-inch pie plate. Beat cream cheese, 1/2 cup sugar and vanilla in large bowl with mixer until well blended. Add eggs, 1 at a time, beating after each just until blended; pour into crust. 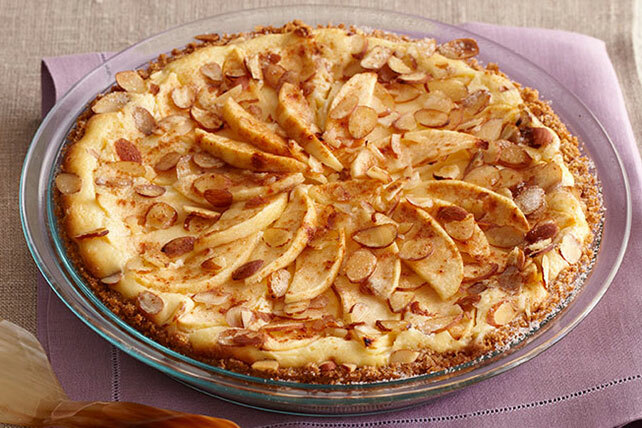 Top with apples and nuts. Mix cinnamon and 3 Tbsp. sugar; sprinkle over cheesecake. Bake 40 min. or until center is almost set. Cool completely. Refrigerate 3 hours. Enjoy one serving of this rich and indulgent treat at celebrations with your family and friends.